A woman with a bomb strapped to her body hid in a crowd of civilians in Sri Lanka on Monday, blowing herself up as security forces frisked people fleeing the northern war zone and killing 28 people, the military said. The suicide attack, which killed 20 soldiers and eight civilians, led to fears the Tamil Tiger separatists - boxed into a small strip of land on the northeastern coast and on the verge of defeat - will increasingly turn to guerrilla warfare in their battle against government forces. The Red Cross estimates 250,000 civilians are also trapped in the area. The military has accused the rebels of using the civilians as human shields and called for noncombatants to flee to government-controlled areas. The rebels have accused the government of indiscriminate shelling, including in a government-designated "safe zone," leading to increasing civilian casualties. On Monday morning, more than 800 civilians had crossed the front lines and were being searched by soldiers when the bomber attacked, military spokesman Brig. Udaya Nanayakkara said. The accused bomber was being frisked when she set off the explosives, killing 28 people, he said. The blast wounded 24 troops and 40 civilians, he said. Footage run on state television showed a child in a purple checked dress lying lifeless on the ground and other civilians lay dead nearby. Plastic chairs they were apparently sitting on as they waited to be processed were overturned, and blood stained the ground. 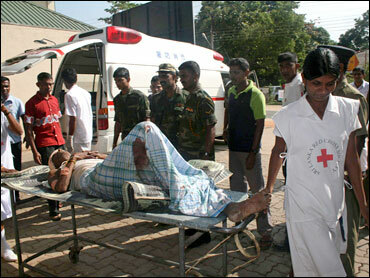 The attack targeted a military weak point: the processing of the masses of civilians fleeing the area. Military officials say the flow of civilians out of the war zone has increased in recent days, with 4,700 fleeing Sunday, bringing the total number of noncombatants to escape the war zone to 20,000 this year, Nanayakkara said. The attack also highlighted concerns that the rebels are trying to blend in with the civilian population so they can fight on using insurgent tactics. "The LTTE is now desperate because they don't have any control over the civilians," Nanayakkara said, calling the rebels by the acronym of their formal title, the Liberation Tigers of Tamil Eelam. "They wanted to stop these people coming in." Independent confirmation of the attack was not available because journalists were barred from the war zone. With most communication to the north severed, the rebels could not be reached for comment. The U.S. Embassy in Colombo called on the rebels "to allow all civilians freedom of movement" and urged the Sri Lankan government to ensure that all civilians who flee the fighting are transferred to the camps "in accordance with international standards." The United Nations also condemned the bombing. "We deplore the loss of civilian life in this targeted killing. It's a blow for people who have suffered so much," said U.N. resident coordinator Neil Buhne. The rebels have been accused of more than 200 suicide attacks in 25 years of civil war and are listed as a terror group by the United States and the European Union. The Tamil Tigers began fighting in 1983 for a separate state for the nation's ethnic Tamil minority after decades of marginalization at the hands of governments controlled by the Sinhalese majority. More than 70,000 people have been killed in the fighting. Nobel peace laureate Jose Ramos-Horta, the president of East Timor, called on both sides to agree to an immediate cease-fire, to allow aid groups and independent journalists full access to the conflict zone and to begin immediate talks for a political resolution to the conflict. He also offered himself as a mediator. Also Monday, the air force hit a camouflaged building inland where the rebels' sea wing hid its craft, Nanayakkara said. "The place was destroyed," he said. The military also reported killing 34 rebels who tried to break through the front lines Saturday in an armored truck.